I just got new glasses, and of course my prescription changed, ever so slightly, so that it seems as if my peripheral vision, just the edges of it, is warping just a teensy bit. It’s as if the light making its way through my retina is curving as it passes through my lenses. Of course you do, you’re smart. And to be clear, this isn’t about me or my declining eyesight, it’s about Peter Tran, who once again appears to us as, ahem, “Curved Light,” as if in a dream, drifting through modular synthesizer half-corporeality. Airs of Modality (Unifactor) sounds like clouds billow, pastel and melodic and buoyant and light. But let’s drop some heavy isotopes in the middle of all this bubbling delight. Airs of Modality is a “live rescoring” of the “Hoichi the Earless” section of Japanese horror anthology Kwaidan , which I haven’t seen because I’m squeamish just thinking about that scene in Beetlejuice where Geena Davis rips off her own face. Let’s just say I’m coming in cold to this one. If it’s a creeped-out soundtrack of hovering tension that you’re looking for, you’re not really gonna get it with Airs , at least not for a while. That whole pleasant cloud thing is totally true, and I imagine it works as a delightful counterpoint to the visuals. It doesn’t really get “horror-y” until about (maybe just over) halfway through, when “Hidden Ritual, Pt. 2 / Revelation” takes on a more somber tone that continues through the end of the tape. And that tone is a tough one to shake — nightmares for days from Hoichi, and Curved Air, and “The Invocation / Final Encounter”! But it’s a great ride. My vision distorts with pleasure. None of this has any bearing on Bloom Lake (Unifactor), Landstra’s first recording in his new environs. “Love in a Mist” is a rendition of optimism across fifteen minutes of improvised synthesizer, as if the distance traveled and the life upheaved were worth the effort. “Bloom Lake” on the B-side drifts contemplatively as that new environment is taken in, mulled over, examined closely, and found to be satisfactory in the end. All told, the move seems to have been a good one for Landstra. And not a moment too soon, it turns out, with that whole Chicago-is-the-coldest-place-on-the-planet thing. But I have no time to google at the moment, because I’ve stuck my noggin into Headband’s proton exhaust manifold and come away with a shimmering galactic space dome for my troubles. Physics warp all around Duncan Moore’s synthesizers — he’s the captain of this crazy ship after all — as if everything we do and do not know about Earth is fair game out in the vastness of space, liable to be rendered insignificant when faced with wider universal truths. For example: magnets — do they work like we expect them to? (To be fair, my expectations are more confused than anything.) Another example: will this beard that I’m growing continue to flourish out here in zero G? Whether or not you can make sense of this crazy science foray is less important than hurling yourself unprepared into Headband’s void here. Knowledge of anything is secondary — the only prerequisite is allowing your mind the capacity to expand as far as it goes and in whatever shape it goes in. Maybe the oscillations and textures are messages. Maybe they’re catalysts intended to fire up the parts of our brains we don’t consciously use. Either way, I got nothing useful beyond my eternal prattlings. Nothing but a shimmering galactic space dome now. For my troubles. My brother-in-law’s a sculptor. He’s into Rodin. There’s just something about Rodin that he gets, something that speaks to him. He’s got this thing for The Burghers of Calais — he’s just wild about that one. Perhaps he feels the deep sense of self-sacrifice inherent in the piece, the heroism in the face of almost certain death. Perhaps he’s confused by this display of bravery following humiliating defeat, and his attempts to process that conflict within himself has led him down a path of artistic expression. 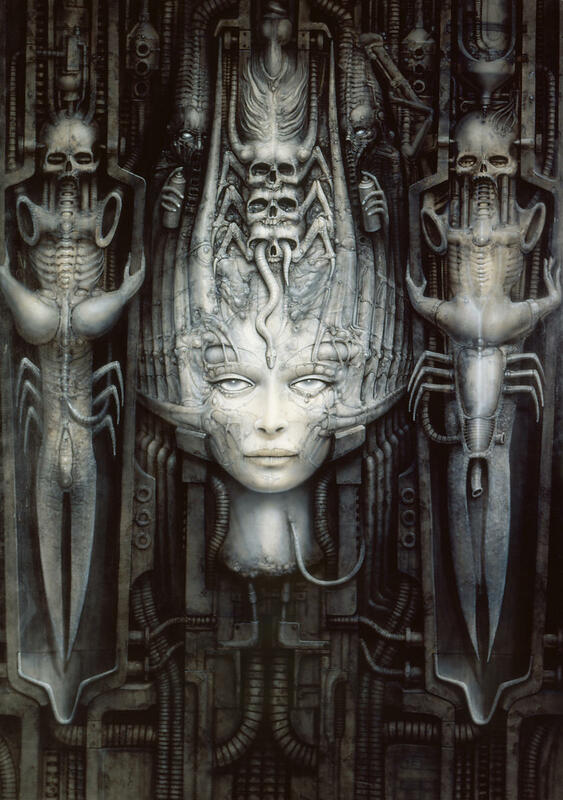 But he’s also super into H. R. Giger, so of course most of his work looks like biomechanical superwomen or xenomorphs. Inner turmoil obliterated by a chestburster. Birch Cooper and Brenna Murphy, the duo MSHR, are digital sculptors, fashioning pixelated monuments in code and sonic formations in circuitry. The video for “Wave Guide Edifice,” the lead track from their forthcoming (4/20!) tape Phased Trance Constructions on Unifactor, combines, seemingly effortlessly, the interplay between sight and sound. But what the hell am I looking at here? These glowing, ahem, edifices, these undulating waveforms, these bright structures, all triumphs of imagination, all projections of extraordinary insight. All these things, born of the process of personal discovery, supernova’d outward in dense manifestation of intricate detail — no single idea is wasted, none is omitted. The noise and the form rage within MSHR, striving to connect! Or maybe that’s just whatever narcotic cocktail they’ve decided to ingest, who’s to say. Still, the synthesized soundscapes form the basis, the backbone, of the psychotropic workbench, undulating and pulsing with otherworldly energy. And again I ask: what the hell am I looking at here? This isn’t Rodin. Or Giger. These are abstract monuments to soundwaves, terraforming cassette players via magnetic tape interference. Don’t you just want to be a part of that? You can. You will. There’s no reason not to. Use your imagination. Sculpt all kinds of crazy stuff in there. Phased Trance Constructions is your navigational matrix.